Locks are not the only part of physical security, but they certainly are an important part of it. Having the best front door locks possible will go a long way to helping achieve a higher level of protection from all types of crime. All renters, property managers, and homeowners should be aware that a criminal is most likely to attack the weakest part of a building’s security. Getting the most out of one of the best front door locks means strengthening your doors, securing windows, and layering your security. But 34% of burglars use the front door, so no matter what, it is good to have one of the best front door locks. Smart locks are not focused on security. They are more concerned with convenience. But when it comes to finding the best front door locks, you still want a product that is going to offer you something in terms of security. Whether it is versatility, limiting the types of attacks, or the best baseline of defense, those factors add up to security. And that security is in turn balanced against the features most customers want in their smart lock. With so many locks that you can open with your smartphone, you need to know the best front door locks that use smart technology. The Yale Real Living front door lock has earned its place as one of the best front door locks, due to its quality and unique considerations. One of the first things you will notice about this lock is that it is available with a keyed lock cylinder and as a key free model. Though Yale does make relatively high-grade lock cylinders, I have chosen to highlight the key free version of this product. This is largely due to the fact that by having one method of entry it increases security by limiting the potential attacks. The keyless model cannot be picked open, though there is the potential for a cyber attack. However, the keyed lock has the potential to be opened with lock picking tools and cyber attacks. But both versions of this lock also uses an emergency battery port that can jump start the lock if the batteries ever die (a common issue with all available smart locks). The lock is Z-Wave compatible and will pair with your smartphone for Wifi based control. The is smart lock has taken many of the failings of other smart locks into consideration and come up with a product superior to many of the other smart locks you could use as front door locks. The August Smart Lock has made its way onto the list of locks that cannot be picked. 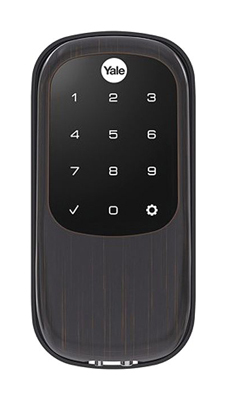 This has a lot to do with the fact that it does not have a keyway, similar one of the available keyless versions of the Yale smart lock. However, this lock is not replacing your existing deadbolt, like most other smart locks. Instead, it is only replacing the interior thumbturn of your existing lock. This allows you to install the August on one of the many other best front door locks on this list. You can have convenience while still maintaining whatever level of exterior security you desire. The ability to pair this smart lock with another one of the best front door locks makes it very enticing, but it is also the most discreet smart lock on this list. The fact that the smart lock is inside the building will keep potential intruders from being aware they could attempt a cyber attack. And the lock uses low energy Bluetooth communication, with the ability to invest in a product called the August Connect, which will allow the lock to use Wifi protocols. There are other thumbturn replacement smart locks on the market similar to the August, but none of them have the track record of this company. Often the other products are bulkier with a less storied company, which is unlikely to exist long enough to make the inevitably necessary software updates. The Schlage Sense is a solid meat and potatoes kind of smart lock. 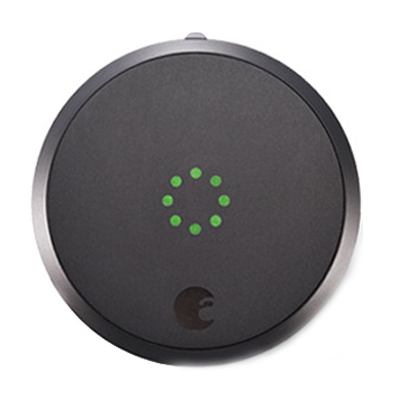 It has the Z-Wave enabled compatibility that allows you to pair the lock with other smart devices in your building. The cylinder is high-quality, but it also has a built-in alarm that will go off and remotely warn you if the keyway is tampered with. This type of remote alert is the perfect utilization of the smartphone pairing feature. All locks can be picked given enough time, but there are very few locks that can contact you so that you can respond. The keyed cylinder comes standard, but if you are comparing the Yale Real Living with the keyed cylinder to this product, the obvious choice becomes very blurred. 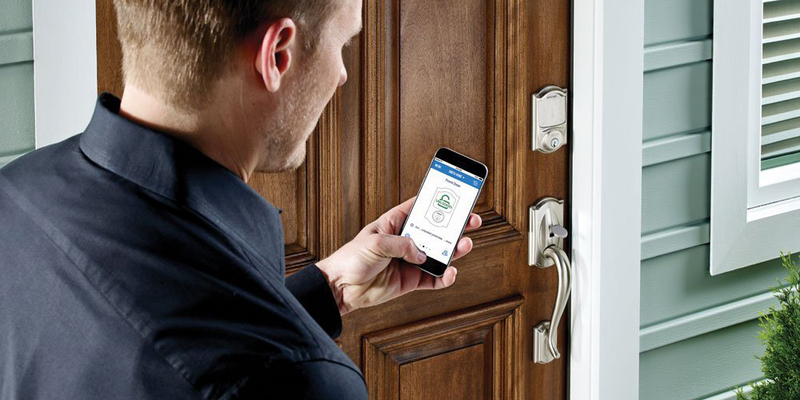 The case for the best front door locks that uses smart technology becomes less clear when certain available options are not utilized. 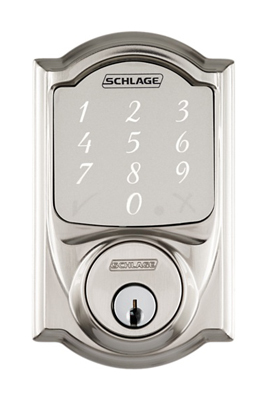 If you are looking for a smart lock with a keyed cylinder back up, then you should certainly consider the Schlage Sense as one of the best front door locks for your needs. Deadbolts are a foundational part of security. When most people are searching for the best front door locks, deadbolts are their main concern. A deadbolt uses a bolt to extend into a bored hole made in the frame of a doorway. This bolt can only be extended or retracted by manipulating the keyway (hopefully with the proper key). If the deadbolt is only a single cylinder, there is likely an interior thumb turn mechanism that allows the bolt to move without the use of a key, as long as the user is inside the building already. 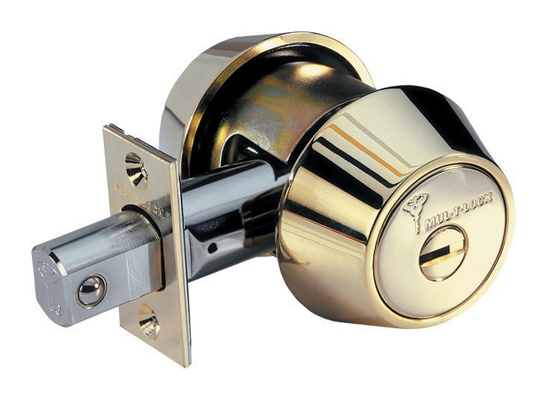 Standard deadbolts use a rim cylinder, opposed to a mortise cylinder. Deadbolts are graded on how well they withstand forced entry attacks and given a ranking of one through three, one being the highest. It is the deadbolt and not the keyed knob that provides the security for your front door. 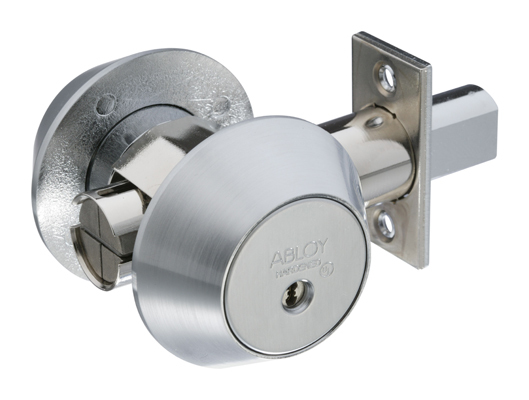 The Abloy Protec2 is a highly advanced and quality made disk detainer lock. The use of false gates on every disk inside the lock makes picking attacks near impossible for even some of the most skilled locksmiths and locksport enthusiasts. A false gate is a cut on the internal disks that simulates the feeling of the disk being moved to the proper rotation point. These gates are intentionally shallower than the true gate. Bump keys do not work on this lock due to the need of rotation and not elevation. And unlike most locks that you will find in Home Depot, the Abloy Protec2 has the potential for more than 2 billion key combinations, so it is pretty unlikely that someone will happen to have your key. Because you are not going to pick this lock open, the next step for criminals would be to try violently open the door. All I can say is good luck. Even the faceplate over the deadbolt is hardened steel. The bolt can withstand 2 tons of force. Any criminal hoping to cut or drill this lock will be going through a lot of bits or blades, making a lot of noise and taking a lot of time. If anyone is looking to steal your key and make a copy, they will also have a hard time due to the complexity of the cuts and the ball bearing control mechanism. You cannot go to the hardware store and get a blank for this type of lock. The BiLock is a very innovative design from an Australian manufacturer. From the look of the key and the U-shaped keyway, you may be able to tell that the lock is interacting with two different sets of pins and sidebars. This doubles the number of pins that need to be picked in comparison to similar high-security locks. No one is going to be bumping this lock open, mainly due to the key shape and exclusivity of key distribution. The amount of skill you need to open one of these locks is quite extraordinary. Two rows of 6 pins and each with false gates that will make you think that you are making progress when you are really only binding the lock. Drill protection is an interesting phenomenon with this lock. It does not have any additional hardened steel inserts to deflect drilling attacks, but I think it would be a mistake to say that it is not drill resistant. The complexity and oddity of the lock would make knowing your specific drill points very unlikely. When it comes to key control, the uniqueness of these keys is extraordinary. The most recent BiLock keys have an active element at the base of the key that interacts with a bottom pin, just so unauthorized duplication is even more difficult. The Mul-T-Lock Hercular is installed with an MT5+ core, which uses a dimple pin in pin system, a slider sidebar mechanism, plus an active element on the key. With this type of pin in pin mechanism, both the exterior and interior pin will be raised to different shear lines. This is beyond the ability of most lock pickers, let alone burglars (who are not usually as good at picking locks as hobbyists or security professionals). Bumping the lock is not likely, though it is, technically speaking, possible. There is also very little reason to worry about someone copying your key as Mul-T-Lock key blanks are not readily available and duplicates are only made for those who have the lock’s key code card (which comes with the lock). Because almost no criminal will be able to open your lock covertly, they are going to try and force it open. If they are attempting to pry the lock open, they will have a hard time getting the bolt out of the strike, even if they can make a gap in the door. When the bolt is fully extended ball bearings protrude and grip the metal housing inside the doorjamb. Cutting the bolt is unlikely to work with the 1-inch solid hardened steel bolt. Drilling is prevented with ball bearings at all key drilling points (lock screws, shear line, etc.) so that drill bits to glance off. A mortise lock is different from the standard rim cylinder deadbolt construction. 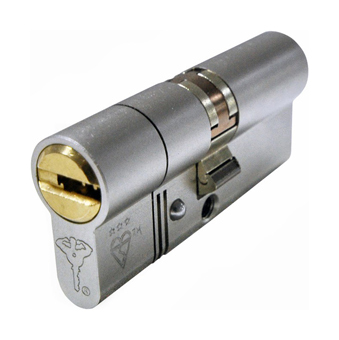 This type of lock cylinder can be threaded into a lock body, which slips into a rectangular pocket precut into the door. These cylinders are simple to remove and replace without fully replacing the existing lock body. You need to make sure that the diameter of your old cylinder is consistent with the high-security cylinder you are replacing it with. To get the best front door locks, you need to make sure that your measurements are always right. If the product does not fit properly, it is less likely to function properly. With this Mul-T-Lock mortise cylinder, you are getting a high-security that takes into account close to every possible security vulnerability. The lock core is the incredibly secure MT5+ model. Anyone hoping to open this lock covertly has their work cut out for them. Picking and bumping the lock are both possible, but they are extremely unlikely to work. With the overall complexity of the internal mechanisms, a number of skills and resources to make a bump key is quite extreme. Picking such a high-security lock requires a level of dedication that most criminals do not have. As mentioned earlier, these cylinders use keys that are difficult to copy without having the proper purchasing documentation. And key blanks are also not as freely available as most other standard locks. However, covert entry protection alone is not enough to make this one of the best front door locks. The pins inside are a mixture of nickel silver and stainless steel to prevent drilling out the core. This comes along with other hardened steel inserts throughout the lock. This is just a lock core to be installed in a mortise lock body, which will have protections of its own. Medeco is one of the most trusted lock brands in existence. Burglars and even mildly security savvy individuals have heard of the amazing security Medeco locks provide. There have been many claims made about the various issues with these lock cores, but the company has taken steps to address their past failings. After Marc Weber Tobias exposed several bypasses in 2011, the locks were updated to no longer be susceptible to the previous vulnerabilities. As long as you purchase a lock manufactured after 2011, the lock will not have the described vulnerabilities. This leads to a lock that is extremely hard to pick open and very secure against forced entry. The internal mechanism is a pin tumbler. And not even a variation like a tubular lock or dimple lock. However, the key pins for Medeco locks are tricky. They use angled cuts so that each pin needs to be elevated and rotated to the correct position. Lock picking is extremely difficult because of the need to lift and rotate takes time and expert precision. Bumping is not impossible, it is just highly unlikely. There are anti-drill measures in place as well, which earns the lock cylinder a UL rating of 437. The keys are also controlled and difficult to make through the use of unregistered users. The Abloy Protec2 remains one of the most secure locks in terms of both picking resistance and forced entry. Made of quality hardened steel that limits any criminal’s chance of marking up the face plate, let alone getting a drill bit to bite into the metal, and even more unlikely to drill in deep enough to compromise the lock. Like any other mortise cylinder, it will fit into a full lock body, which will be responsible for the rest of the violent entry resistance. Unlike the best front door locks that were deadbolts, the bolt work and the mortise lock are two different products that interact. When it comes to picking resistance, there are very few locks in the same league as the Abloy Protec2. You will not find many verified successful picking attempts documented with this lock. That is not to say they are not out there, but they are rare and they are done by extremely dedicated lock picking hobbyists. The chance of a criminal having the particular skills honed for this unbelievably complicated lock is almost a non-issue. And you can forget about anything like bump key opening your lock. If a criminal is going to defeat this lock, they will need to be on the level of the most talented lock pickers in the entire world. If your door uses a euro cylinder lock, it may be difficult to install other types of locks without replacing the door or going through a lot of woodworking. It may just be better to choose one of the best front door locks that are available with euro profiles. These locks have special considerations when it comes to bypass methods. For example, all thumbturns on euro cylinders should be removed. You must also know the length of the cylinder you will need. Purchasing a cylinder too large for your door will make the lock vulnerable to attacks. If the lock is too small, there will also be issues with installation. Ideally, the lock face should be flush with the door. Make sure to measure this distance before purchasing. 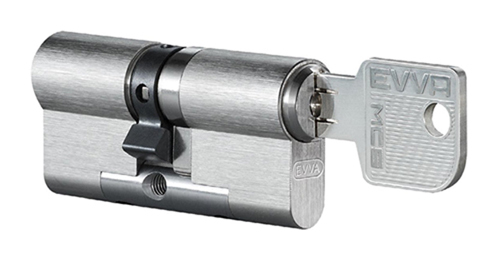 The EVVA MCS is one of the most unique styles of locks on the market today. It is very uncommon to see a magnetic lock in general, but a lock that uses a magnetic key and pins that result in a successful high-security product is even rarer. The end result is a near unpickable lock. Covert entry is almost impossible as even key duplication is near impossible. However, there have been some documented bypasses, but those relied on access to the original key in order to decode it. But that matters very little because unlike other locks, there are no key duplicator or key blanks are on the market. The main concern with euro cylinders is the possibility that they will be snapped in half and then opened. You might be surprised to see that the EVVA does not have the anti-snap breakaway cuts, but it is snap resistant. 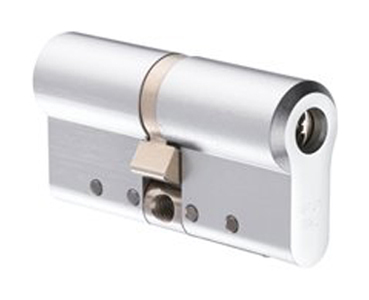 Instead of allowing sections of the lock to snap, this cylinder uses steel inserts to strengthen the lock body. The end result is that hopefully after an attempted burglary you will not have to replace a lock that has been broken into a few pieces. It is important to invest in the hardened cylinder so that you can get all of the drill protection as well as snap resistance. The non-hardened cylinders cannot be considered among the best front door locks mainly because they are intended for interior doors. Without hardened steel, the composition of the lock is harming the overall protection provided by the Protec2 core. With strengthened metal, torque and cutting attacks (including drilling) will require a level of tool quality, skill, and product insight that most common criminals do not have. Just like anything in security, you cannot be completely immune to forced entry, because there is always more force you can theoretically apply. Keeping in the theoretical, I have said it before in the other sections that have mentioned this type of lock core, but the Abloy Protec2 is one of the best most pick resistant locks available. Maybe not as resistant as the EVVA MCS, but still good enough to prevent almost anyone from ever covertly opening your lock. Unlike forced entry, there are some types of covert entry that can be completely prevented. For example, bump keys require a certain type of locking mechanism that is not present in the Protec2, so these locks cannot be bumped open. That is one method of entry that all thieves approaching this lock will have to abandon. If you haven’t read the other sections that include the Mul-t-Lock as one of the best front door locks, I will fill you in on what you need to know about this product. We start with a key that interacts with three different locking mechanisms. A pin in pin system, a sidebar, and an alpha spring (active element). It is certainly not unpickable, but it does give even some of the best lock pickers out there a bit of trouble. The sidebar uses a slider system with 5 different sliders that have to be moved past multiple false gates. Keys are very hard to get your hands on, and even more difficult to duplicate. The many different components of the lock that need to be manipulated each provide a barrier to simple duplication efforts. The anti-snap protection is similar to the other best front door locks in the euro cylinder category. With hardened metal on the body of the lock, exerting torque on the cylinder is not as simple as it would be on other euro cylinder locks. In 2017, these are the best front door locks to buy. Between all of these brands, you can find a product that works for your door and your security needs. Whether you want a smart lock or some form of lock cylinder, you can now be sure to get the best front door locks. Be sure to balance your security considerations and layer your protective efforts. These types of considerations will help to get the most out of the security provided by the best front door locks. Install these products today, and start living a safer life.